I want to acknowledge a magnificent takedown of a terrible pseudo-scientific article. Have you seen this BuzzFeed post on your Facebook timeline recently? “8 Foods We Eat In The US That Are Banned In Other Countries”, written by Ashley Perez summarizes some claims made in “Rich Food, Poor Food”, a book by Dr. Jayson Calton and Mira Calton. It’s intended to give us the ‘real truth’ about the horrible chemicals that we’re ingesting on a daily basis. The problem? It’s complete nonsense to anyone who knows even a little bit about chemistry. “Now, the claim that arsenic “will kill you if you ingest enough,” as the article concludes, is true. But as scientists like to point out, the dose makes the poison. So let’s look at the dose here. So not only did BuzzFeed (and, one presumes, the authors of the book that BuzzFeed extracted this information from) completely get the most basic chemistry wrong, it also misleads people terribly by not discussing dosage. Ingesting small amounts of a substance is not equivalent to ingesting massive amounts (the dosage that’s generally used for toxicity studies on lab animals). 12 ounces of Mountain Dew a day (the amount in a can), while certainly not good for you, isn’t equivalent to the 135-676 ounces ingested daily* by the people reported in the scientific literature as having BVO-related symptoms. As someone immersed in a culture of athletes who take their diets very seriously, I completely understand the concerns of people who read this article and were alarmed. Eating the wrong kind of food can seriously impact sport performance, and nobody wants to eat chemicals that might give them cancer. I’m therefore furious at Buzzfeed for posting such misleading pseudoscientific “information,” instead of legitimate facts about food quality and safety issues that people could learn from. Why would they be so irresponsible? “In my experience, people who write things like this have divided the world into two categories: wholesome, natural, healthy stuff and toxic chemical poisons. But this is grievously simple-minded. As I’ve emphasized in passing above, there are plenty of natural substances, made by healthy creatures in beautiful, unpolluted environments, that will nonetheless kill you in agony. Plants, fungi, bacteria, and animals produce poisons, wide varieties of intricate poisons, and they’re not doing it for fun. So keep this in mind and approach claims with skepticism the next time you see supplements advertised as “natural,” or writers decrying something as “non-natural.” It’s just not that simple. Do your own homework and go deeper. I hope that BuzzFeed and media outlets like it will take seriously the scientific criticism and do some basic research before publishing their next article, rather than mindlessly reproducing the arguments of authors hoping to make money selling supplements. But it seems unlikely. Pandering to the pseudoscience crowd appears to generate more attention and ad money than actually providing information that people can use. And unfortunately, it’s those earnestly health-conscious, well-intentioned readers of these articles who suffer the consequences of misleading information. *Even when I was going through the dark period known as DISSERTATION WRITING HELL, in which my eating habits were the worst of my life, I couldn’t have imagined consuming that much Mountain Dew. I hope none of you ever do that either. **Predictably, in response, he spent the weekend being called “a paid shill for Monsanto, DuPont, and all the other evil monied interests” which at least “made a refreshing change from being called a paid shill for Big Pharma.” Because evidently ALL scientists who say things that conflict with people’s worldviews must be selling out to corporate interests. Next Article Wednesday morning bats! Thanks for the article, its refreshing to read a scientifically based discussion on these issues instead of Political rally cries. Another great one. Did you see the link to Lowe’s article before I sent it to you? I sort of hope so…I like to think that thing had gotten around. Anyway, I saw this when Alexander posted it to Facebook. Your following is growing. Is there a way to subscribe to this? I’m technologically handicapped…haven’t a clue to how to do it. Although I appreciate the intent of your article, I’d urge you to turn the tables and view from the “natural” world position. My father is an herbalist who manufactures herbal supplements. He is restricted by your beloved scientists on that very same idea that, a little comfrey root will kill you because if you interveiniously inject pounds of comfrey root you, obviously, will most certainly die. I think we all inderstand that if you inveiniously inject pounds of anything you will experience the same effect. For the reason that the FDA “scientists” are more powerful than really any other authority in a food producing business, if you want to legally sell anything, our hands are tied. I appreciate your posts but you always discuss the idea of everyone viewing the whole picture and you are very good at manipulating articles to seem well rounded. The fact of the matter is that they are not. You have a very strong opinion and you have every right to express your ideas. I support and encourage your sharing. I’d just love to see true well rounded research if you are going to claim it. “Scientists” are not entitled to dominate my entire perspective just because they bear the title. Apparently, just like with everything…it matters to some kids, but not all. Dr. Lowe’s response cites a SINGLE scientific article, which by your own standards is BS. The article also concludes only that “While these strictures could have positive effects on behavior, the removal of food dyes is not a panacea for ADHD”. Yeah, I think we figured that out from all the other articles not mentioned. I’m not saying we MUST ban food coloring, but considering the lack of its nutritional value, it seems like a good idea. I mean, sure, we don’t ban peanut butter because 2% of the population is now allergic to it, but peanut butter actually has a purpose and nutritional value. Also, I’d like to point out that of the original 24 food dyes allowed in the U.S., 17 are now banned by the FDA. 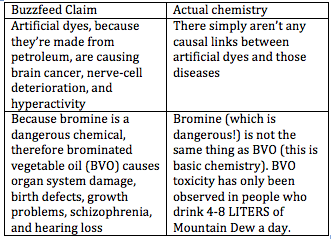 So, some food dyes were found to be carcinogenic, and there are scientific studies that have been done in other countries suggesting the remaining ones are dangerous as well. That is why they have been banned in those countries. Do you think the scientists in France, Germany, and the UK are somehow worse than our scientists? They’re just no good? The FDA will not ban something unless THEY fund the study themselves. They have the stupidest system I can think of for approving foods to be marketed. They approve most food additives until proven unsafe, instead of forcing companies to prove a drug IS SAFE. Ridiculous, and completely corrupt. It’s true that people like sound bites and memes. People love to pass on cute little graphics that are basically fluff stories, as proven by Facebook. But that doesn’t mean that they’re all pseudo-science garbage and we shouldn’t believe anything they say…they are just a hook for further research. Like watching TV news, they don’t provide substance, but at least they get you looking at the problem. I’m not going to say I approve or disapprove of the methodology of BuzzFeed, because my brain doesn’t operate that way…however I know many other people that love that sort of thing, and don’t think about anything in particular unless they get a Museum-placard-worthy introduction to the subject.